the Social Shuttle: When Will This Fashion Die? When Will This Fashion Die? 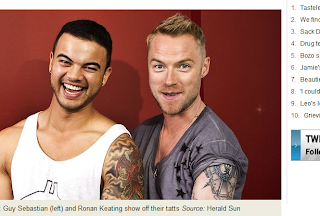 Ros Reines writing in the Sunday Telegraph has ripped into the current X Factor judges ( and contestants) who sport tats and insist on displaying them at every opportunity including Ronan Keating and Guy Sebastian the committed Christian who seems to be trying to re-assert his 'street-cred' to balance his palm waving life. Lachlan Murdoch and wife Sarah Murdoch both sport them and recently the estranged wife of media mogul Mike Willesee, Jordana Willesee turned up at a Hermes party sporting a newly inked depiction of Jesus Christ although she expressed reservations that the Thai tattooist had given the Saviour a slightly Asiatic look. 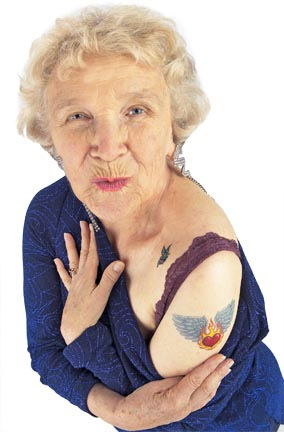 Past 40, tattoos are not a look and maybe it's time to call time on this fashion!.